At the peak of his career Reginald Last held one of the most powerful positions in the English book trade. As head book buyer for W.H. Smith between 1957 and 1965, Reggie Last bought books in quantities which would be mouth-watering to any publisher today, and earned respect for his impartiality and unfailing courtesy towards demanding sales executives. His instinct for predicting sellers was invaluable to W.H. Smith in the days before tele-ordering and EPOS systems had reduced the risks for booksellers of ordering stock from publishers (who were reluctant to accept returns). Tony Pocock, then sales manager of Oxford University Press, remembers the confidence with which Last placed a huge initial order for the controversial New English Bible (New Testament) in 1961; a shrewd decision partly inspired by his strong Christian faith and rewarded when other booksellers ran out of stock while the book was reprinting. The previous year, Penguin Books had been prosecuted for publishing Lady Chatterley’s Lover. While Last admired W.H. Smith’s policy of not stocking material deemed offensive, he agreed with the jury which found Penguin not guilty of publishing an obscene article. Against strong resistance from inside the company, he successfully argued that W.H. Smith should stock it, and bought copies to be safely tucked away until the final verdict. Reginald Albert Last was born in Woburn Sands, Bedfordshire, to Edith and Edward Last. The youngest of five, he decided not to follow his two brothers into their father’s business as a wheelwright. After an education at the local school which was disrupted by staff leaving for the First World War, he applied for a shop assistant’s job advertised in the window of W.H. Smith, and began his career with the firm in 1917, at the age of 14. 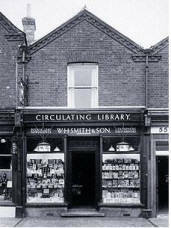 Thanks to its station bookstalls and circulating library, W. H. Smith was a household name; Reg Last believed the company would offer him scope to progress. It also provided the education which would be vital to his success, inspiring an informed passion for books which lasted a lifetime. From Woburn Sands, where he was quick to learn (and to devour the contents of the lending library), Last was transferred to Chippenham. He started work before breakfast, collecting newspapers from the station and organising deliveries. Sometimes he did rounds himself, pedalling to outlying villages on a red W.H. Smith bicycle with a pannier. Having worked in the shop all day, he would return to the station after supper for six copies of the Evening Standard which were thrown from the eight-fifteen London to Bristol express so that the butcher and his friends could read the horse-racing results. Last struggled on his wages, despite cheap lodgings (with a weekly soak at the local baths and cups of tea at the YMCA), and was bullied by the manager. When the regional superintendent bumped into Last’s mother in Woburn Sands and asked how he was getting on, she told him. Last was instantly transferred to Bath, working briefly in the kiosk outside the station before joining the Milsom Street branch, which carried a wide stock for its middle-class clientele. Here he gained essential bibliographical knowledge through unpacking publishers’ parcels and dealing with customer orders. Most importantly, by watching how the lending librarian made it her business to recommend the right books to individual clients, he learnt the secret of personal bookselling which ensured his popularity as manager, from 1946 to 1951, of W.H. Smith’s most prestigious shop, Truslove & Hanson in Sloane Street, London (where he once sold a set of A.A. Milne to the Queen of Spain). In 1921 Last was promoted to be assistant book buyer at W.H. Smith in the Cornmarket, Oxford. Making a recording with me for the National Life Story Collections Book Trade Lives Oral History Project in 1999, he lit up when describing Oxford. It was a heady time. Customers included John Buchan, Evelyn Waugh and the former prime minister H.H. Asquith, who would pull up in his Rolls-Royce on Friday evenings, en route to his country home in Sutton Courtenay, and ask “Last” to recommend a thriller for the weekend. Last attended training sessions run jointly by the Oxford Booksellers Association at Blackwell’s, where he was inspired by speakers such as Robert Bridges, John Masefield and Walter de la Mare. A fellow student was Tommy Joy of Thornton’s University Bookshop, a year younger than Last, and also destined to reach the top in London bookselling. After some years on W.H. Smith’s relief staff, Last became manager at Goring-on-Thames (where Kenneth Grahame would pop in to the shop after walking upstream from Pangbourne), then moved in 1937 to W.H. Smith in Sevenoaks, where he fell in love with Marjorie Holbrook, a vivacious 20- year-old library assistant, in whose company Reg Last -who could otherwise seem reserved – sparkled. It was not surprising that, after they married in 1939, Marjorie played an important role in the social life which underpinned the book trade of the time, and Reg felt that their marriage, which lasted until her death in 2001, had been fundamental to his success. Reg Last’s retirement at the statutory age (for W.H. Smith employees) of 62 came too early, but he shared his deep love of books with family and friends until the week he died. His enthusiasm for sport was also infectious, and the panache with which he won the Booksellers Association golfing cup at Gleneagles in 1964 is engraved on the minds of those who celebrated with him. Reginald Albert Last, book buyer: born Woburn Sands, Bedfordshire 4 June 1903; Head Book Buyer, W.H. Smith 1957-65; married 1939 Marjorie Holbrook (died 2001; two daughters); died Sevenoaks, Kent 5 May 2002. Reginald Last, born in 1903, son of the coachbuilder, left school when he was fourteen years old and took a job with Smith’s Library, delivering their daily papers and eventually qualifying for a post in the shop where he served as an assistant for some years. Promotion came in due course and he was sent to another branch, later to become a relief manager, travelling round the branches and so gaining more experience. Amongst other places, he passed through Oxford on his way to London where he was first at Sloane Square, then at Bridge House, and finally at Kingsway. The following extract from The Sunday Times of 11th December 1955 tells its own tale; it was written under the heading of “People and Things” by Atticus. “Where power resides There is one name in the book trade, and only one, that makes all authors and publishers tremble. That is R. A. Last. The public has never heard of Mr Last and would not be particularly impressed that he is manager of the book department of W. H. Smith & Sons. Yet, in the book world, power resides in Mr Last’s hands and in that world, “How many will Last take?” is the sixty-four-dollar question. For Smith’s sell a decisive proportion of our daily reading. Last Judgments Fortunately Mr Last, a small upright man in his early fifties is both kindly and scrupulously just, and his judgment, particularly in the case of young striving writers, errs as far towards the generous as his commercial sense and responsibilities allow. But about 14,000 new books and 6,000 reprints cross his desk every year, and this flood allows no room for personal tastes or prejudices. He has to order what the public will buy, or Smith’s book department would go out of business. As the books pour in – fiction, travel, biography, children’s – Mr Last picks each one up, notes the name of the publisher and author, and the price, and turns up the sales figures of the author’s previous book, considers the appeal of the jacket, and says, ten copies or perhaps ten thousand. Reg Last with seventy years of life behind him, has now retired to Gooden, where he can sit back, and take life easier; but he has not given up all connection with books The Book Society has honoured him by making him its President.